"I have been looking for a wonderful, rich queso dip. I took the best of two recipes that sounded good, plus added my own flair. I made this for my family and co-workers and had to make another batch, because there wasn't any left for me! Transfer finished dip to a small slow cooker to keep warm; serve with tortilla chips or add to your favorite Mexican dish! Enjoy!" Heat a double boiler over medium heat. 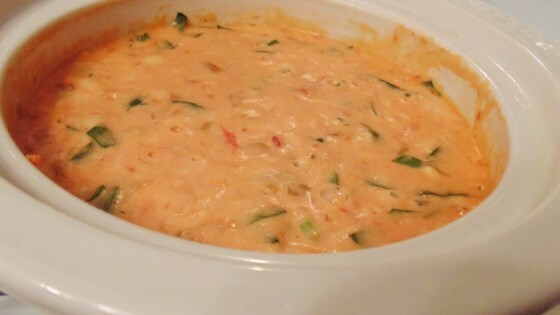 Once the water is boiling, add half-and-half, cumin, garlic salt, white American cheese pieces, shredded Monterey Jack cheese, chopped green chiles, and diced tomatoes with green chile peppers, respectively, to the bowl of the double boiler; cook, stirring often, until the cheeses are melted and the mixture is smooth, about 15 minutes. Stir spinach into melted cheese mixture; heat until the spinach wilts, 5 to 10 minutes. Transfer finished dip to a small slow cooker to keep warm. Stir milk into the finished dip to make it thinner, if you prefer, or to help keep it loose as it begins to congeal. Total hit @ the party!! But, I just put everything in the crockpot and kept stirring it. Everybody loved it! It was actually a disaster. Never thickened, had to serve in individual bowls, and served with spoons. Flavour was good, but I wanted a thick cheesy dip. This was not it.